When astronomers say “A star is born,” they usually mean a big ball of gas has turned into a massive, controlled atom bomb. While we do have our celebrities — The Guardian has been live-blogging Professor Hawking’s birthday conference — they are rarely of the matinée idol variety. But that’s all about to change! Astrophysics’ latest movie star is not a scientist — indeed, not even a person — but a telescope! 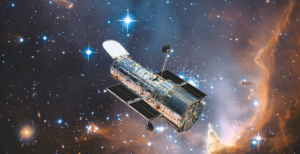 Award-winning independent filmmaker David Gaynes has made a documentary, Saving Hubble, chronicling the life and times of this most high-flying of scientific celebrities. Of course, a picture is worth a thousand words, and with 24 frames per second at 70 minutes, we are talking 101 million words to do it justice . . . so, if you are at AAS, or in one of the other screening locations, see the film! But, while you’re waiting, I bring you a note from the filmmaker himself, who has somehow managed to synopsize the film in just 53 words. First, though, a little bit about Hubble and why it needed saving, and then a little bit about David Gaynes. Conceived in 1962 (think Sputnik and the Cold War), funded in 1977, finished in 1985, in orbit by 1990, the Hubble Space Telescope has helped pin down the age of the universe, the nature and history of galaxies (think black holes and cosmological structure formation), and the birth of stars and planets. Powered by the Sun as it circles the Earth at 13 times the speed of a Concorde jet, the Hubble is a Cassegrain reflector (2 mirrors, one with a hole, to increase the focal length) with five instruments plus a guidance system. But in 2004, NASA administrator Sean O’Keefe (and I know this makes him look like the bad guy . . . the film will tell you more) more or less unilaterally decided that there would be no future servicing missions to Hubble. His reasoning may have been related to the Columbia shuttle accident safety report (the shuttle was destroyed on re-entry in 2003), but his decision provoked an outcry by both citizens and Senate. Here’s a first-hand account from an STSI member who was at the cancellation announcement; NASA’s official reasoning for it is here. Ultimately, a (probably unpleasant) 11 months later, O’Keefe resigned, and the mission was reinstated two years later, in October 2006. Even in outline, a dramatic and compelling story — and a heartening remembrance to those of us saddened by the recent intimations of Hubble’s successor JWST’s looming cancellation. This story was what got me into astronomy. The genesis of the film was the decision to cancel Hubble and my outrage, in general, about the policies of the day. I intended to make a film about space policy as a metaphor for American policy, but ultimately the story turned on me and because the American public seemed so unwilling to let Hubble go, it became more of an affirmation of the curiosity of the human spirit and an inquiry into how Hubble became so endeared to so many . . . Saving Hubble documents the people of America’s successful fight to save the Hubble Space Telescope from becoming space junk. It is also about the expansion of the universe, the power of images, things in common between figure skating and spacewalking, the Eisenhower Interstate Highway System, God, and the wisdom of cabbies in Nashville. Filmmakers are expected to synopsize their films efficiently and entertainingly in any number of venues: Thanksgiving at Mom and Dad’s, friends’ kids’ birthday parties, annual physicals. I’ve never had an easy time of it, especially when the doctor is holding my balls. That’s why the 53 word synopsis speaks for me, when possible. It’s the most succinct explanation of a movie that took seven years to make and burned out many, many magnetic strips on my credit card. Please don’t think that my 53 word synopsis means I don’t like to discuss the film at length, circuitously. I do and I welcome the opportunity. Please introduce yourself if you see me at the 219th semi-annual gathering of astronomers in Austin starting January 9th. You may find me or my associate Carol hanging posters, handing out brochures, or contorting our faces in desperate attempts to comprehend what’s happening in the Large Magellanic Cloud. It is our greatest wish that the professional astronomy community embrace this film and actively work with us to help distribute it to a large, general audience. One of the film’s strengths is how it places astronomical concepts in a larger context: where we are in the history of space exploration, how it is that we successfully built and funded machines that show us the earliest light of the universe, and who the hell cares about any of it (most everyone, it turns out). It has long been my belief that Saving Hubble is not a film about Hubble at all, but an exploration of cosmological consciousness among a diverse sample of everyday people as well as an examination into the cross-currents of space policy during a confused moment in American political and cultural history. Many films have been made about what Hubble teaches us about the universe. This is the first film that explores the question of what Hubble teaches us about ourselves. We need partners — astronomers who want to participate in question and answer sessions following screenings of the film; university departments that will invite us to screen the film; people with telescopes who will patiently guide audience members in stargazing sessions following screenings. This concept of connecting people to the universe in conjunction with screenings is called “The Hubble Roadshow.” Email me for a brochure; check out the website. Help us help you advance your own work and deepen the connection that people already have to the universe. We welcome partnerships with scientists who believe in communicating the importance of their work to everyday people and we look forward to many transformative Roadshow events in the near future! Hubble was actually conceived in the 1940s by Lyman Spitzer. In the 1960s it became a plan by NASA, which was founded in 1958 following the launch of Sputnik in 1957. The first person to talk about a telescope in space was Hermann Oberth in 1923 for a doctoral dissertation in Germany.